CPM stands for Critical Path Method, a project controls process that identifies all the discrete bits of work that go into the full body of work for whatever is being planned, and organizes those bits of work into their logical sequences, creating the Plan”. RPMI likes the phrase “Plan the Work, Work the Plan”, as it encapsulates the objective of CPM scheduling. RPMI has been scheduling complex projects for over twenty-eight years. RPMI’s method of producing and updating cost- and resource-loaded CPM schedules is a product of extensive failed-project research as part of its delay analysis and expert witness services for owners, designers and contractors in project delay litigation. Through this experience, RPMI understands how an effective, updated schedule can leverage both an owner and a contractor away from the need for litigation by providing the means to immediately identify delays, present solutions, and predict the results of remedial efforts. RPMI has PM-level CPM schedulers experienced in all areas of construction who understand project planning and control. For more information on the principles of CPM Scheduling read our article “CPM and Resource Loading“. To learn about some of the common misconceptions in building a Project Master Plan, read our article, “Master Plan Myths“. RPMI has an excellent record on the projects it schedules and maintains for builders – there are no delay claims at the end of the project. This is not to say these projects do not have delays, every project does somewhere along the line. The difference is that in the normal course of schedule management, RPMI identify, quantify, and bring focus to issues that present schedule risk, regardless of ownership. RPMI respects, and causes its clients to respect, the obligation to mitigate damages to all parties, and leverages the CPM schedule to accomplish this, on a cyclic (typically monthly) basis, as a normal course of action. We have some great stories to tell about this process and our track record. 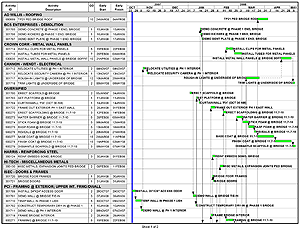 Resource and Cost loaded detail construction schedules. To learn more about Construction Scheduling and CPM/Resource Loading, please read our article CPM and Resource Loading. RPMI reviews the contractor’s monthly schedule submission, which includes the electronic schedule file, from the start of construction through completion. RPMI reviews the schedule for content, progress, logic, and changes since the previous update. Consistent with the initial schedule review, RPMI submits a report documenting its findings and resolves issues arising from its review. This effort focuses on avoidance of claims, mitigation of impacts and proactive solutions. RPMI will administer bidding and negotiation of FF&E contracts, coordinating Owner-purchased item delivery and installation, and managing the work of others responsible for these services.RPMI provides management support to the equipment planning consultant, including determining the relative responsibilities of Owner and the consultant, delivery time frames, use of mock-ups, training, and key decision points in the schedule. Master Schedules built from individual multiple project schedules with fully loaded resources. Schedules for Commissioning, Acceptance and Punch List milestones. Owner and contractor furnished equipment and material schedules. Schedules for furnishings, fixtures and equipment.